Very relaxing and enjoyable stay in a beautiful condominium. Everything was very easy - really didn't have to contact anyone - everything I needed was emailed to me. It was a very fun trip for us and our sons and their fiancs. We had a great time laughing, relaxing and being together. Great time by all of us. Your team responded quickly, communicated clearly, and were friendly. They espoused the Aloha spirit. My stay allowed me to thoroughly relax for the first time in several years. When I left, I felt transformed and energized. Thank you. We will return. The team members were wonderful, polite and responsive. The grounds were very well maintained and everyone was incredibly friendly and helpful. The unit we stayed in, J33, was absolutely beautiful, well maintained, tastefully decorated and had everything we could have wanted in a vacation condo for our entire family. It was a spacious corner unit on the top floor overlooking the golf course and lake as well as the volcano. Waking up to that view and having fresh fruit and coffee each morning was incredible. We were also able to make great use of the grill and table outdoors. The garage was stocked full of beach toys, chairs, and even a wagon to pull everything down to the beach in. In addition to the beach being about 10 minutes away, we also walked to the Hilton hotel to use their absolutely gorgeous pool and beach facilities as well (its fantastic for kids too with the gondola and train rides taking guests from the lobby to various parts of the hotel). OVERALL, my trip was fantastic and I will absolutely go back to this resort and stay in this unit (if its not already taken)! It was a pleasure! Always felt informed about my rental and loved my late checkout! Annemarie was very helpful in resolving a comfort issue with the bed. The matter was resolved within just a few hours. We were impressed. 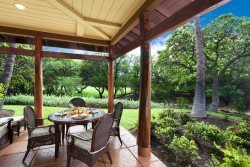 We were very happy with our stay at the Waikoloa Colony Villas. The location gave us easy access to swimming, beautiful walks, shopping, and restaurants. It surprised us at how comforting ut was to have all necessary household items right at our fingertips. We will definitely stay there again. Mahalo! Great service. Responses were very prompt. The property accommodated us very well. anne marie moynahan is a five star member of your team! very helpful and so supportive of the reason why we were traveling (for the hawaii state high school tennis championship tournament). thank you anne marie! you are the BEST! our unit, 1004, was so beautiful! my husband and i were delighted to come home everyday to such a well decorated, well appointed unit! the owners of this place are very nice to share so many of their supplies and equipment with renters like us. thank you to the owners and to resortica for making our stay so wonderful and stress free! we will be looking forward to staying here again! We called when we arrived on a Sunday to see if we could get into the condo early. The people we talked to were VERY friendly and helpful. We met the cleaning crew on the way in and they were also very nice and friendly. This property is wonderful! The inside is lovely and had everything we needed and more. The beds were all comfy and the air conditioned rescued us from the humidity. The pool is just steps away and really beautiful. The property is right across from GREAT shopping and restaurants. Just great all around!